GeneWatch UK today welcomed the withdrawal of Oxitec’s application to release millions of genetically modified (GM) olive flies in Catalonia, Spain (1). The withdrawal follows requests from the Catalan and Spanish regulators for further information. Oxitec’s decision to withdraw its experimental application follows requests from the regulators in Spain for further information about their technology, which involves the release of large numbers of GM olive flies to mate with wild ones. The female offspring of the GM olive flies are programmed to die at the larval (maggot) stage when many will still be inside the olives where the female lays her eggs. Concerns raised by GeneWatch UK include impacts on the food chain and human and animal health of large numbers of dead GM maggots in olives, and the environmental impacts of releasing large numbers of non-native GM flies which cannot be contained (2). 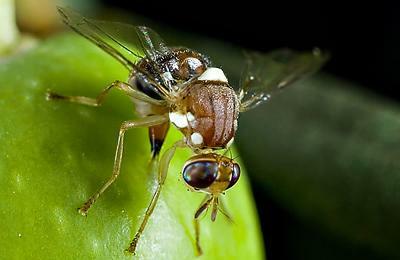 Oxitec’s application to make large-scale experimental releases of GM Mediterranean Fruit Fly (Medfly) in fruit orchards in Brazil was also withdrawn from the agenda of the regulators CTNBio’s December meeting in Brazil last week (3). This application was submitted to Brazilian regulators CTNBio in January 2013 and will now not be decided until next year. Concerns about large numbers of GM maggots in fruit and the impact on fruit export markets are also likely to be a major issue in consideration of Oxitec’s application to release GM Medfly in Brazil. “Oxitec’s proposals to release millions of GM flies to mate with wild flies would leave large numbers of GM maggots in the olives or fruit. This is unlikely to be acceptable to growers or consumers, so plans to release these GM insects into the environment will bring no benefit and would involve unnecessary risks” said Dr Helen Wallace, “In addition, it is clear that not enough is known to be able to predict the environmental consequences”. Experiments using Oxitec’s GM mosquitoes continue in Brazil but the authorities have indicated they would need evidence that the technology actually reduces the impact of the tropical disease dengue fever before approving Oxitec’s application for commercial use (4). Impacts on dengue fever are uncertain because small numbers of mosquitoes can still transmit disease and complex effects on human immunity mean that a partial or temporary reduction in mosquito numbers can sometimes worsen the impacts of the virus (5).